Please join us for a pre-lecture reception at 6:15 pm on November 2nd, in the main auditorium at the Odum School of Ecology for this event. The lecture will begin 7pm. Although they are ecologically rich, aesthetically gorgeous, and often tightly linked to human history, grasslands, especially in the southeastern United States, have been largely lost and forgotten while the plant and animal species that depend on them have become increasingly rare. As a Georgia artist and nature lover who grew up in a region where there is enough rainfall to turn most any patch of dirt into a forest in only a few decades, falling in love with the wild beauty of grasslands has been a revelation for Philip Juras. Philip will present a visual tour of landscape paintings that document his journey of grassland discovery. Drawing on early descriptions of the presettlement landscape by chroniclers such as William Bartram and his own studies and adventures in southern nature, Philip’s grassland route traverses high mountain balds, grassy Piedmont barrens, historic Alabama prairies, and the once vast pine savannas of the coastal plain. Then, from the colorful seaside meadows of the Georgia coast, Philip’s exploration continues beyond the Southeast to the lush tall grass prairies of the Midwest and the gorgeous high elevation páramo of the Andes. Through all of these settings his paintings celebrate the rich aesthetic qualities of grasslands while also highlighting that these are threatened ecosystems deserving of our attention. Georgia artist Philip Juras’s paintings are an expression of his desire to experience, understand, and celebrate the natural world. He explores the rich aesthetics of a wide range of ecologically intact environments by combining direct observation with the study of the natural science and history of the subject. Philip received a Bachelor of Fine Arts degree in 1990 and a Master of Landscape Architecture degree in 1997, both from the University of Georgia. His MLA thesis examined pre-settlement grasslands that once flourished in the Southeast, a subject that continues to inspire his artwork. His ongoing projects include Georgia’s barrier islands, fire adapted landscapes of the Southeast, tall grass prairie restoration in Illinois, and the páramo and cloud forests of the Colombian Andes. In 2011 Philip’s exhibition, The Southern Frontier, Landscapes Inspired by Bartram’s Travels, opened at the Telfair Academy in Savannah, Georgia. With is its corresponding award-winning exhibition book, it explored the southern wilderness as William Bartram documented it in the 1770s. The Wild Treasury of Nature, A Portrait of Little St. Simons Island opened in 2016 at the Morris Museum of Art in Augusta, Georgia. That exhibition and accompanying book examined the natural environments of one of the most ecologically intact barrier islands on the East Coast. 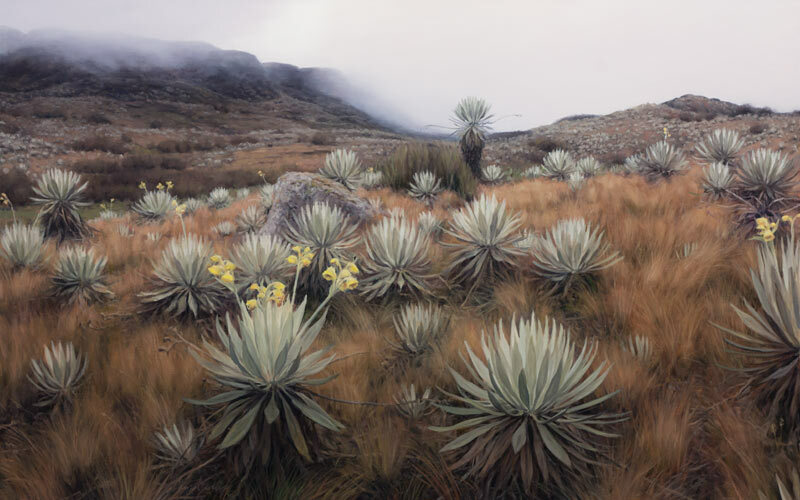 His 2017 exhibition, Landscapes of Chingaza (Paisajes de Chingaza) at the Biblioteca Virgilio Barco in Bogotá, Colombia, celebrated conservation of the high elevation environments of Colombia’s Chingaza National Park. Please join us at 7 pm at the Odum School of Ecology, at the University of Georgia, in the auditorium.